Baku will welcome the 2nd International Symposium on Sculpture "The song in the stone". With the organizational support of the Heydar Aliyev Foundation, the event will be held on October 1-10. Twenty sculptors from Azerbaijan, Ukraine, New Zealand, Turkey, Iran, Tunisia, Jordan, Spain, Serbia, Great Britain, Russia and China will join the symposium, Trend Life reported. The participants will create various works from natural stones in Gala village, a home to the open-air Historical and Ethnographic Museum. The first International symposium on sculpture " The song in the stone " was held in 2016. Fourteen sculptors from 10 countries took part in the event. 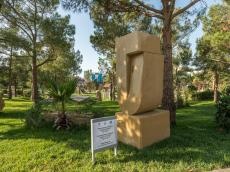 The works created within the framework of the symposium are currently exhibited in the park complex "Sevir?m" in the Khatai district of Baku.